February 1979. As bodies lie unburied, rubbish piles in the streets and schools shut down due to fuel strikes, the Winter of Discontent is the final nail in the coffin of the 1974-79 Labour Government. Crisis? What crisis? While in Doctor Who we have The Armageddon Factor, the culmination of the 26-week Key to Time story. In a way, the most astonishing thing about The Armageddon Factor is that it got made at all. Graham Williams was not a lucky producer. He took over just when inflation and behind-the-scenes problems conspired to make Doctor Who increasingly difficult to actually do. Then, the planned last story of his first season had to be canned because it was unachievably ambitious, and desperate measures led to Williams and script editor Anthony Read cobbling together The Invasion of Time around existing sets and costumes, and emergency location filming. Apparently, Season 16 was equally hard going, with Williams staggering from one crisis to another. Behind the scenes, Tom Baker was arguing with practically everyone, and around the time this story was being made he was threatening to resign. That unhappy workplace might be one reason for the mass exodus of regulars between this season and the next: Mary Tamm and John Leeson quit, and Anthony Read threw in the towel as well. Which means it’s maybe a surprise that The Armageddon Factor is quite so good. It starts with a deliciously cheeky parody of bad drama that’s obviously meant to wrong-foot the viewer. Then, it opens out into a grim diorama of John Woodvine’s bloodthirsty Marshall spouting bellicose jingoism as Lalla Ward’s compassionate Princess watches disapprovingly. Lalla Ward isn’t an obvious choice for new companion, but then, Astra isn’t obvious companion material – too earnest, too accepting of her fate. She’s definitely missing the second Romana’s ability to keep a straight face even when she’s clearly taking the mick. However, what Ward brings to Astra is a certain otherness (those scenes in Part Four when she stands transfixed by the Key, or when she becomes almost fatalistic about her own nature) combined with a haughty façade that hides a much kinder character. Put those together with what Mary Tamm was pushing for behind the scenes – a bigger role with more interesting things to do, and then later for Lalla Ward to be cast as her replacement – and you can see the elements of the second Romana coming together in The Armageddon Factor. Even in her first scene, Ward brings an edge to some of her lines with Woodvine, and the tight, sarcastic little smile she throws him on her way out of the door is brilliant. As she heads off into the wrecked corridors of Atrios, the rather threadbare design aesthetic of the Graham Williams stories comes up trumps, for once. Atrios is deliberately grotty, coloured in washed out browns and greys, with a kind of muddy patina to everything. For all you can argue the pros and cons of the rest of the Williams episodes, it’s hard to defend some of the design choices: Season 15 had some particularly awful examples of barely adequate sets, weak monster design and notably poor effects. The Armageddon Factor turns some of these shortfalls to its advantage: Atrios and Zeos are consciously similar planets, and both are war torn and well past their prime, while the Shadow Planet is suitably gloomy. The writers and production staff have obviously got to grips with what the series can afford to do on its straitened budget, and three main sets and some corridors are pretty much all we get for the remainder of Williams’ run. Meanwhile, the monsters – the Shadow and his Mutes – are cheaply done, but effective because someone has worked out that using the iconic image of Death is within the show’s budget, and they managed it last year with the Fendahl (the closest thing there is to a classic Williams monster). The upshot of all of this is that Bob Baker and Dave Martin have written The Armageddon Factor around the limitations of what can now be achieved. The third and fourth episodes are a perfect example of Baker and Martin’s new budget-conscious approach. Whereas Terrance Dicks always claimed they had wildly expensive ideas (like a skull-shaped spaceship landing in Hyde Park), the info text on The Armageddon Factor tells us, for example, that they actually described a cheap way to achieve the Zeon fleet’s attacking Atrios (using a radar screen rather than models). Perhaps after the previous year’s experience of The Invisible Enemy and Underworld they’d learned that the production team was no longer in the business of working miracles. Even so, they obviously took seriously their brief to write a fittingly grandiose climax to the Key to Time story. It’s certainly the only serial since the first that is actually about the Key and what it represents, rather than grafting the over-arching quest onto a standalone script. For example, creating a fake sixth segment to temporarily enable the Key’s power gives us, for the first time, an idea of what the thing capable of. While it’s clearly impractical to show the whole universe stopping, the image of the time loop (and the clever use of the extending countdown to add another element of jeopardy to the final two episodes) gives a hint of the truly awesome abilities of the Key. But then Baker and Martin do their usual trick of chucking in the kitchen sink: so, on top of the interplanetary war, the Mentalis computer locked in a logical trap, K9 taken over by the Shadow and turned against the Doctor, the Princess as the actual sixth segment, and the decaying time loop, they decide to drop in another renegade Time Lord and reveal the name of the Doctor. One of the pleasures of Baker and Martin’s scripts is the sheer amount they throw at the audience, hoping some of it will stick. This is a fitting farewell to them. Only Peter Grimwade will ever manage to cram in quite so many strange ideas into each script. The theme of the story is clear even in the first scenes. Princess Astra wants to make peace between her planet Atrios and its bitter rival Zeos, whereas the Marshall just wants to bring about the total destruction of his enemies. At no point do Baker and Martin suggest that Atrios is “good” and Zeos “evil”. The whole point is that in any conflict that can lead to mutually assured destruction – the Armageddon factor of the title – no side can take the moral high ground. This idea is picked up in the second half of the story, when the war between Atrios and Zeos is explicitly stated to be a prelude for the war across the whole cosmos. “Chaos shall break upon the universe,” cackles the Shadow – one of the most effectively creepy monsters in this whole era of Doctor Who – at the same time that the Marshall is delighting in the idea of blasting Zeos into oblivion. Meanwhile, characters like Astra and ultimately the Doctor, who aren’t interested in absolute power or total victory, are the voices of reason and sanity. There’s a lovely moment in Part Four when the Doctor and Romana reflect that having assembled the Key to Time they have power over the whole universe – something that no-one should have. In that context the final revelation of the story: that the White and Black Guardians are practically indistinguishable, and neither ought to have control over the Key, makes perfect sense, and the Doctor’s decision to disperse the Key is a deliberate anti-climax, the only logical way to have him still remain recognisably the Doctor. It’s back to the debate in Genesis of the Daleks, where the only right choice is to walk away from absolute power over life, the universe and everything. It’s well known that Douglas Adams wrote the final minutes of The Armageddon Factor including the bit where Tom Baker pretends to go mad with power (oh, the bitter irony for Graham Williams). The creator of The Hitch-Hiker’s Guide to the Galaxy, one of the most highly regarded and successful British authors of the last 50 years, is definitely the most impressive name ever to appear on Doctor Who’s production staff. What’s astonishing about the last scenes is that Adams instantly sees the problem inherent in the Key to Time season – what happens next? Having pointed out that the Guardian is no less corrupt than the Time Lords, Adams has the Doctor essentially blow a raspberry in his face, declare that free will and human life is far more important than some mumbo jumbo about the universal balance of power, and that randomly travelling through time and space is more interesting than going on quests for some higher authority. Essentially, Adams undoes Williams’ whole grand mythology in favour of paring back the show to its most basic principles: a pair of Time Lord exiles, wandering in the fourth dimension. It’s a shame that Mary Tamm’s Romana didn’t get to stay on for the whole series of Adams-edited adventures because her character really comes together here. Her Romana began the season as a slightly aloof character, with a sense of ironic detachment from the ridiculous events she was forced to endure. At the start of The Armageddon Factor, she’s really playing up to that, claiming her optimism has opted out, and treating the search for the sixth segment as yet another tiresome annoyance. But during the course of this story, something about Romana changes. She seems to develop a particular affinity for Astra, which means that when the truth about the Princess’s nature is finally revealed, Romana is appalled. It leads to probably Tamm’s best scene when, in Part Six, she confronts the Doctor about what they have done to Astra, turning a living being into a component of a machine: “No power should have that right, not even the Guardians.” (Was Joss Whedon watching, you wonder). Though it’s quickly forgotten, it’s a great moment: a genuine confrontation that smacks of Sarah Jane’s occasional outbursts. Sadly, in most of her other scenes with Tom Baker, Tamm is merely a very good feed for the star’s ego (although their bemused reaction to learning that Merak is in love with Astra – “Ah…” “Hmm…” – is wonderful). However, elsewhere, she gets more to do: even a bit of Venusian aikido in Part Three (presumably as a last ditch attempt to give Romana some of the special abilities Tamm had been promised when she was cast). You can see how Romana brings a different dynamic to the series: with two Time Lords in the TARDIS, there’s a chance to advance the plot in different ways. 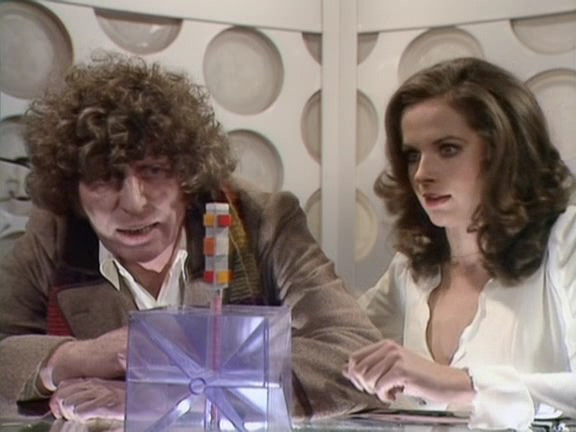 For a big chunk of the middle episodes, Romana adopts Merak as a temporary companion while the Doctor gets to explain the plot to Shapp (a truly diabolical performance that would surely never have been allowed in any previous era. Davyd Harries, your silliness is noted). This is a slightly different way of telling the story than we’ve previously seen, and makes the exposition-heavy bits rather more dynamic than they might have been. Certainly, in the following season the temporary companions – Duggan, Clare Keightley, Chris Parsons, Seth – become a regular feature. However, this is Tamm’s final appearance. Once again, Williams assumed that he could talk his leading lady round to staying. But he didn’t, and so Romana is the first companion since Liz Shaw not to even get a leaving scene. It’s a sad blot on Williams’ record, another example of events overtaking him, and it left the show reeling from yet another crisis. Williams once said, “It’s all about telling stories. Nothing else matters.” In principle that’s fantastic, and you can see Williams really means it. He spotted the potential of Douglas Adams and insisted on making The Pirate Planet despite opposition from the Head of Serials. He co-wrote City of Death, one of the best ever Doctor Whos. On paper, stories about going inside the Doctor’s mind to defeat a monster; about re-telling The Prisoner of Zenda as a space fantasy; about a stranded alien who’ll steal the Mona Lisa and wiping out humankind just to fix a spaceship, are marvellous concepts. But the role of a producer is not just about coming up with good ideas: it’s about actually getting the series made to time and quality, week after week. Season 15 was a huge challenge, and despite everything learned over the last two years, Season 17 was equally problematic, including a BBC post-mortem on the special effects for The Creature from the Pit, and a director who quit because Tom Baker was so out of control. Twice, Williams got to the end of a series without thinking about how he was going to write out a departing actor. The next year pretty much the same thing happened to him, when Shada was cancelled. In the end, the Key to Time falls apart more quickly than it comes together, and the quest finishes on an unresolved note. The Doctor’s been struggling so hard and so long to assemble the thing that he hasn’t really thought about what he’s going to do if he succeeds. There’s a metaphor in there, somewhere, for Graham Williams’ producership. As the end credits roll, a familiar name appears: an ambitious Production Unit Manager who’s been assisting Williams for some time, and thinks he knows how to fix Doctor Who. Let’s see how that turns out. Next Time: “I told you it was amazing. Well, it used to be.” The Doctor visits The Leisure Hive.